CHICAGO, Nov. 9, 2017 /PRNewswire/ -- CNA proudly announced today that it received a perfect score of 100 percent on the 2017 Corporate Equality Index (CEI), a national benchmarking survey and report on corporate policies and practices related to lesbian, gay, bisexual and transgender (LGBT) workplace equality, administered by the Human Rights Campaign (HRC) Foundation. This marks the third consecutive perfect score for the Company, an effort led by Pride@CNA, CNA's employee resource group made up of LGBTQ and ally employees. "Human Rights Campaign challenges organizations to be bolder and better, and all of us at CNA are extremely proud to continue our record of perfect scores on the Corporate Equality Index," said Joyce Trimuel, Chief Diversity Officer, CNA. 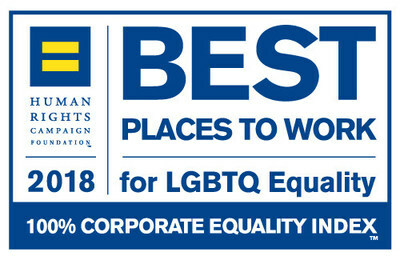 Businesses that achieve a rating of 100 percent in the CEI are recognized as one of the "Best Places to Work for LGBT Equality" and also earn a spot in HRC's "Buyer's Guide," which indicates companies, products and services that support LGBT workplace inclusion. "By embracing diversity and inclusion, businesses transform into places where individuals value each other's differences and welcome diverse points of view. Receiving this recognition from the Human Rights Campaign affirms CNA's commitment to inclusive workplace practices," said Dino E. Robusto, Chairman and Chief Executive Officer, CNA. The 2018 CEI rated 609 employers in the report, which evaluates LGBT-related policies and practices including non-discrimination workplace protections, transgender-inclusive healthcare benefits, competency programs and public engagement with the LGBT community.